Your resume is your marketing brochure, quantify and qualify as much as possible, never make the reader guess what you have to offer, times have changed. 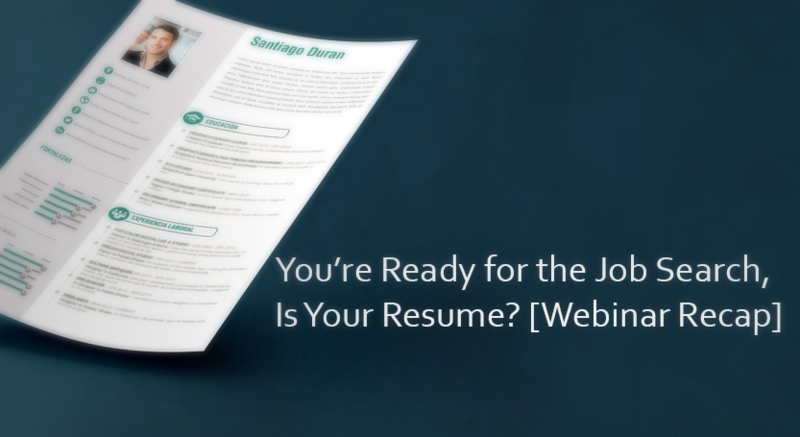 These were the recurring themes throughout our recent Job Seeker Webinar, “You’re Ready for the Job Search, Is your Resume” presented by Christine Nowicki, Executive and Leadership Coach with Kensington International. As an Executive and Leadership Coach with over 20 years of experience, Christine has helped hundreds of professionals take their careers to new heights. 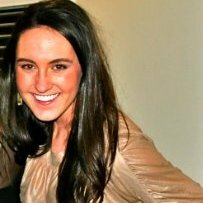 We were privileged to have Christine provide our audience with in-depth market insight, many rich examples, and valuable instruction for writing a winning resume. As a matter of fact, we learned quite a bit ourselves! Never make the reader guess what you have to offer. When companies are looking for a new hire and going through resumes, they want to know, what is the value of this person and why should I hire them? What are they going to bring to my department and my organization as a whole? The purpose of your resume is to provide the clearest and most compelling answers to these basic but defining questions. On average, an employer spends between 6-8 seconds looking at your resume. Therefore, your resume must immediately and consistently make clear what you do and what you have to offer as a benefit to the employer. There are many small changes you can make to your resume to ensure you never make the reader guess what you have to offer. It sells your value! You have to think about yourself in terms of a value-add to an employer and as such, your resume as your value proposition. The main section of your resume is Professional Experience and the focus of this section is on your accomplishment statements. Your accomplishment statements support your bottom-line impact, which is the heart of your value proposition to your employer. Your accomplishment statements answer what, who, why you’re a true value-add to an employer and as such, will be the reasons you are offered an interview. Qualify and quantify your accomplishment statements as much as possible. Your accomplishment statements qualify and quantify your impact on the company’s bottom line by using metrics as much as possible. Strong accomplishment statements that lead to interviews, state how you decreased cost, increased productivity, streamlined operations, met or exceeded goals, and etc. The recommended method for writing quantified and qualified accomplishment statements is the PAR method: Problem, Action, Result. There are great examples and how-to explanations in the webinar. Relevance is the key to marketability. Especially in this ever-changing digital age, it is essential that your resume conveys relevance and adaptability as qualities you have to offer. 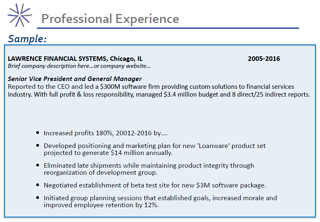 Thus, resume formatting has changed in three major ways: 1) Objective Statements have been replaced by Summary Statements, 2) ATS rejects 75% of resumes not because of qualifications but because of formatting mistakes, 3) The header needs to include a URL link to your LinkedIn profile and remove your address completely. Use a format preferred by employers and recruiters. Header: The header is your name and contact information, centered at the top of your resume. The contact information that must be included is your first and last name, email address, cell phone number, URL to your LinkedIn profile. It is strongly recommended that your email address is professional and updated to a recent host—get rid of AOL and the like. Professional Experience: Professional Experience follows your summary and is the main section of your resume. The formatting of this se ction is important because it must be logical, include all necessary information, and be consistent throughout. The heart of your professional experience is made up of your bulleted accomplishment statements. Accomplishment statements support your value proposition and help sell you, by enabling the employer to project your future performance based on your past accomplishments. Looking for more examples? Additional Experience: Military Experience, Education/Professional Development, Technical skills, Professional Affiliations, Board Positions, Volunteer Work should be listed at the bottom in specific formats. Professionals today need to visualize their career and always be market-ready, Christine encourages. We, at Advanced Resources, share that philosophy and believe in always providing our candidates with insights and resources to help achieve greater job search success. Visit our Job Seeker Webinar Page to get insight on important job seeker topics, watch recordings and download slides.